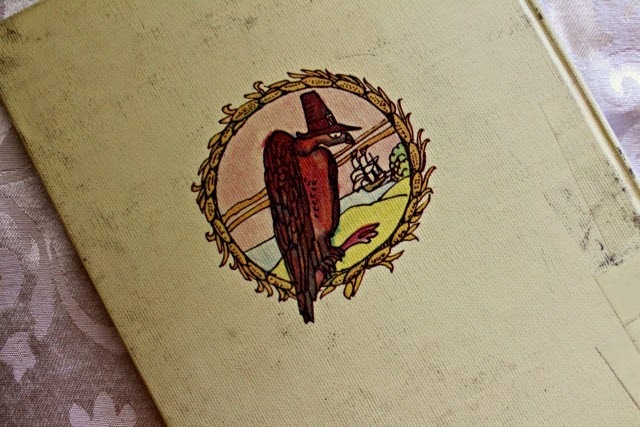 Lothrop, Lee & Shepard Books, 1982. I didn't check out too many library books for Thanksgiving this year. If you want to see what we read the past couple of years, click here. 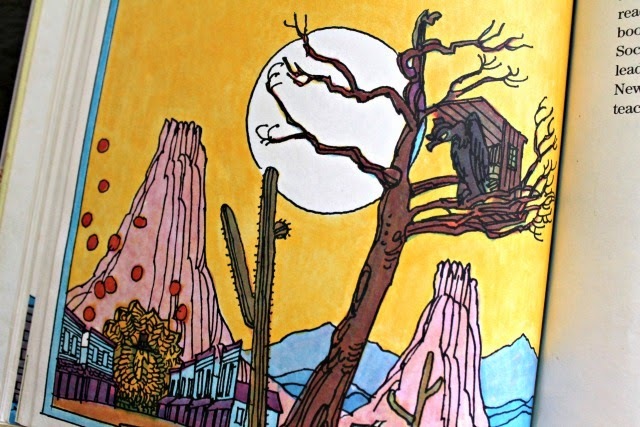 These illustrations remind me so much of other books and cartoons from the early 1980s. 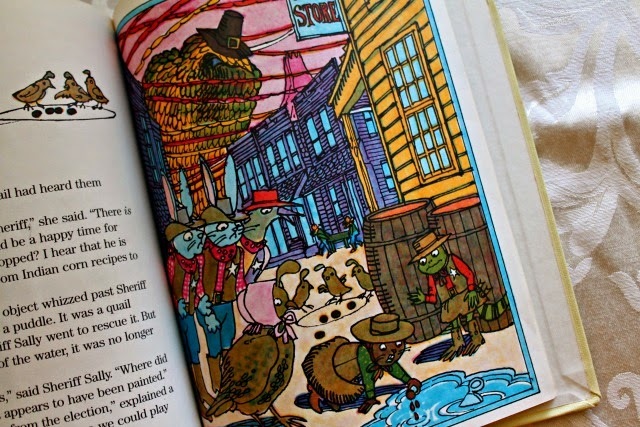 I would have been in kindergarten when Sheriff Sally Gopher and the Thanksgiving Caper first came out. As familiar as the style may be, I don't believe I ever read this one, nor any other books by Robert Quackenbush. So story-wise, this one is a mix of weird, silly, and strangely educational. The critters of Pebble Junction are preparing for their big Thanksgiving corn feast. 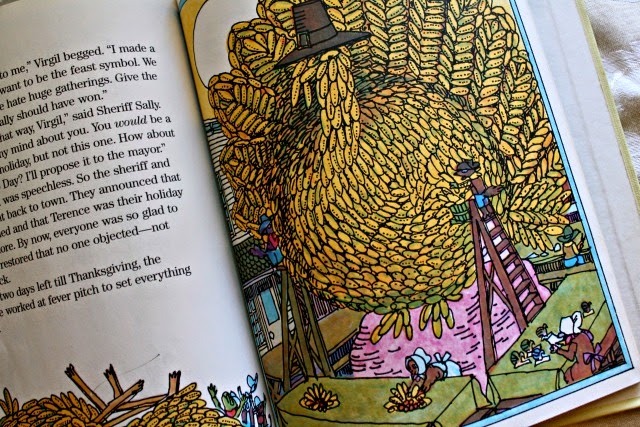 A giant turkey, modeled on one Terence Turkey, is being constructed from ears of corn, when Virgil Vulture (such a tongue-twister when you read this book aloud!) storms into Sheriff Sally Gopher's office. He is angry about Terence Turkey being the symbol of Thanksgiving, when Virgil's ancestors were present at the first Thanksgiving, too. After all, who else would clean up the remains of the meal but a vulture? After paying a visit to the mayor (who is also Sheriff Sally's horse), it is suggested that the issue be put to vote. Dirk Duck speaks up. His ancestor goes back even further, he says. You see, his ancestor was Dutch, and lived in Leiden, Holland. Many of the Pilgrims who fled England settled in Leiden first. While there, they learned about Dutch Thanksgiving, the hutspot feast, which was first celebrated in 1574, when the Dutch drove the Spanish troops out of Leiden. And so, the campaigning begins. Posters and flyers go up. It is decided that voting will be "ancient Greek style, using colored stones instead of paper ballots." The stones used for the election are brown for Terence, white for Dirk, and black for Virgil. After the first box is emptied, Virgil overhears someone saying that Terence was in the lead. Virgil is the last to vote. He carries his stone in a paper bag. When he departs, the second box is emptied. Every stone in the box is black. Virgil has won! Construction starts on a new corn statue. Thanksgiving starts to seem very gloomy. There are complaints. Then one day, a small black object whizzes by Sheriff Sally, landing in a puddle. Upon picking it up, the critters notice it has turned brown! There are chicks nearby, playing marbles. The marbles, it turns out, were from the election. Sheriff Sally and her deputies rush to Virgil Vulture's house to investigate. They find a paper bag. Inside, there is an empty bottle of quick-drying black ink! Sheriff Sally confronts Virgil, who admits he has no idea why he suddenly thought it was so important to be the symbol of Thanksgiving. "Vultures are loners. We hate huge gatherings. Give the job to Terence. He really should have won." The job is given back to Terence. Everyone is so relieved, even Dirk Duck accepts the news with no objection. The big Thanksgiving corn feast takes place as planned. Virgil stays home until it's time to clean up. "So, in the end, Pebble Junction's holiday was a perfect success. It was so perfect that everyone vowed to keep to tradition at future Thanksgivings. And they stuck to their word."